Theresa May must honour “assurances” she’s given that Parliament will get a bigger say on any final Brexit deal, pro-EU Tory MPs say. The government averted a rebellion on the issue after a meeting between the PM and more than a dozen MPs. One of the potential rebels, Dominic Grieve, warned there would be consequences for the government if not. BBC political editor Laura Kuenssberg said a government source had told her no actual concessions had been agreed. 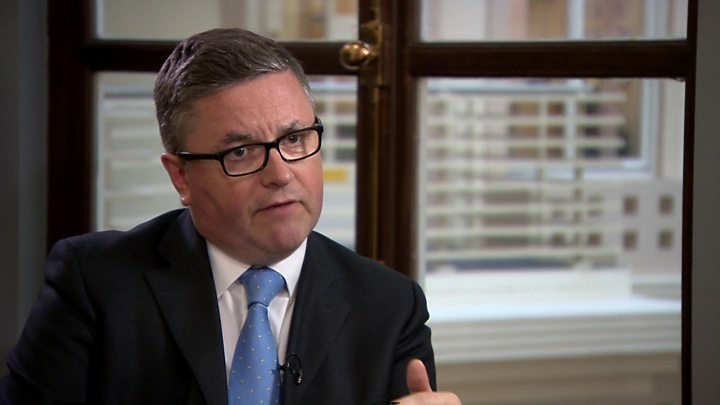 And a senior minister, Solicitor General Robert Buckland, said the government had only agreed to “further discussions” about the way in which they could make “a further step forward”. A group of MPs said on Tuesday they were offered, in a last-minute concession, real “input” if no deal with the EU was done by December. Phillip Lee quits: How big a problem is it for May? The UK is due to leave the European Union on 29 March next year, after the referendum in 2016 when people voted by 51.9% to 48.1% to leave. Given that politicians, like the rest of the country, are divided on what Brexit should look like, this is posing problems for the government as it tries to get the bill through both the House of Commons and the House of Lords. The government is currently trying to persuade MPs to undo most of the changes made by the House of Lords, and on Tuesday this involved a tussle over how much of a say Parliament will get if it does not like the deal struck between the UK and the EU. The government does not want to give MPs and peers the power to say what sort of Brexit deal the UK should strike with the EU, saying this should be left to ministers. 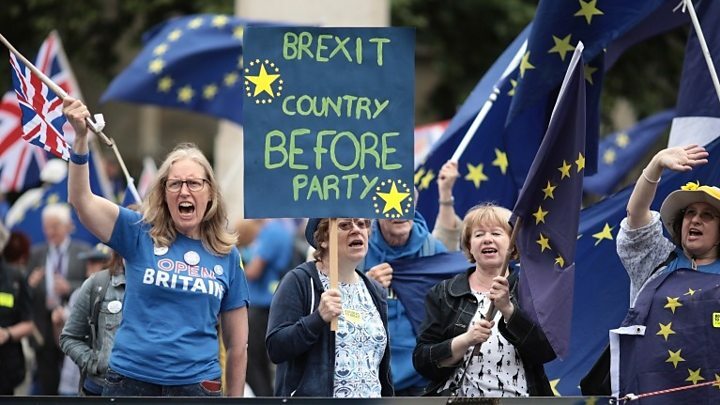 When it came to the key vote, a group of Conservatives who had threatened to rebel agreed at the last minute not to defeat the government after public haggling between ministers and would-be rebels and a meeting between Mrs May and more than a dozen Tory MPs. But it is not yet clear exactly what the MPs were offered and whether they are happy with what has since been said by ministers. “I expect the government to honour its commitments and I expect the PM to honour her commitments and I have no reason to distrust the approach she took with us,” one of the would-be rebels, Dominic Grieve, told the BBC’s Newsnight. Ahead of the vote Mr Grieve tried to broker a compromise between MPs and ministers which would apply if Parliament rejects the final UK-EU Brexit deal. Under his proposals, the government would then have to seek MPs’ approval for its plan of action through a motion in the House of Commons. It would also have to do this if no deal has been agreed by the end of November 2018. Ministers have agreed to consider these suggestions – but not a third strand of his proposals which would require the government to “follow any direction” from MPs if there is no deal by 15 February 2019. 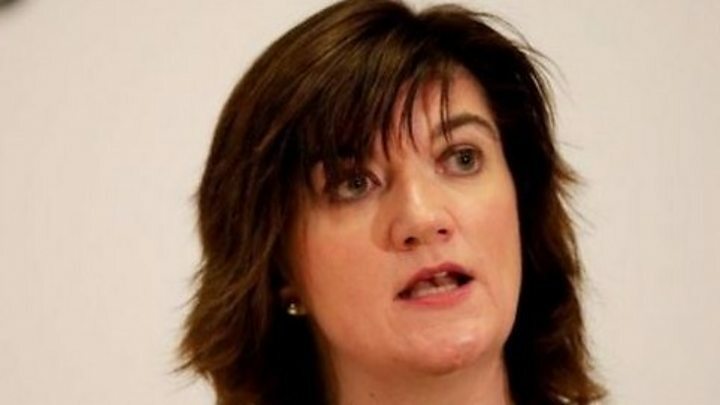 Remain-supporting Conservatives Anna Soubry and Nicky Morgan were two of the MPs to meet with Mrs May. Ms Soubry said she trusted Mrs May to “honour the undertaking she gave”. Believe me, in Westminster, there is a very very big difference between the promise of more serious chat about something with the possibility of a change – and a promise actually to do something different, especially if it is made by the occupant of Number 10. So just hours after the concession, (or non-concession) very, very dark mutterings began from those who had been persuaded by what they thought was a promise. Eurosceptic MPs have criticised moves to give Parliament more power as Brexit approaches, saying this would be used to “wreck” the UK’s EU departure. Tory MP Andrew Bridgen, a leading Brexit backer, said the concessions could “come back to haunt” the government if they amounted to a veto over the terms of the UK’s departure. He told the BBC that rebels were seeking a “wrecking motion”, stating: “It not only has the risk of stopping Brexit, it is certainly going to make the negotiating position of the government considerably diminished. The EU Withdrawal Bill is now back in the House of Commons, with MPs debating the rest of the Lords amendments. These include a requirement to seek membership of the European Economic Area – an arrangement like Norway’s that would keep the UK part of the EU single market. This is opposed by both the Conservative and Labour leaderships, despite the backing of some pro-EU MPs in both parties. There is also an amendment requiring the government to report to Parliament on steps taken to negotiate a customs union with the EU. The government has rejected this one too, and has proposed an alternative amendment referring to a new “customs arrangement” which was thought to have averted the possibility of a rebellion on that subject. Tempers flared in the Commons as MPs discussed immigration, with Speaker John Bercow appealing to members to “respect” each other’s arguments. Ms Soubry said she was “appalled” at a speech from Labour’s Caroline Flint and accused her of not appreciating the value of immigrants. Ms Flint had argued for new immigration controls, saying people wanted to be able to “turn the tap on and off when we choose”. She said she was not against all immigration but that her constituents wanted a “fair and managed system”. Earlier some MPs claimed an amendment passed on Tuesday night could have implications for the government’s preferred trade options after Brexit. Labour’s Shadow Brexit Secretary Sir Keir Starmer highlighted the amendment, which committed the government to avoiding any “physical infrastructure, including border posts, or checks and controls” in Northern Ireland after Brexit. He said this meant one of the government’s proposals for replacing the customs union – a technology-based solution to minimise border delays – could be “unlawful” if it involves any border infrastructure checks. Labour’s whips’ office said it expected eight votes to take place from 19:30BST.